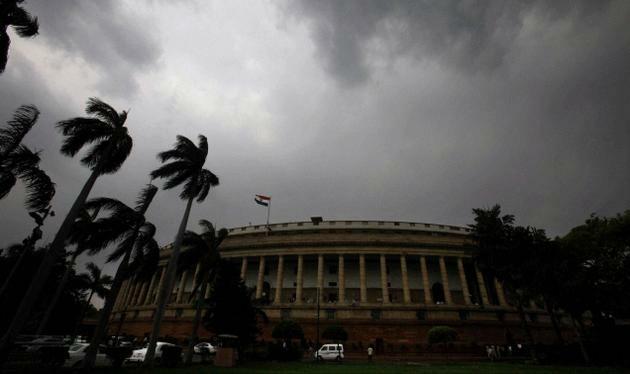 A couple of mornings back, the skies of Delhi were overcast with dark, grey clouds. Coupled with cool winds, a light drizzle and very pleasant weather, the monsoons were here, a day earlier than expected. Now that was then! Since then all is well with the world. Delhi is back the way it is meant to be – swelteringly and unbearably hot! Clouds have been an important motif in Hindi film songs. It is sometimes a messenger who has to pass on a message to one’s beloved far away. Or it refers to the deep sorrows dwelling in the heart of a bereft lover. Or a beloved’s thick flowing hair is compared to the dark grey clouds in the sky. They are turbulent, teasing, playful and sometimes outright cruel. Numerous songs are present using the various synonyms – Badal, Badra, Ghata, or Megha. This is a list of 10 songs that have the words badal or badra or badarva in the first line of the song. Which would automatically exclude Itna na mujh se tu pyar badha (Chhaya). Also the usage of the word should be more literal rather than metaphorical. Hence songs like Nainon mein badra chhaye or Kahan se aaye badra (the song that I was humming) are not here. 1) Dheere dheere aa re badal (Kismet, 1943, Ashok Kumar and Amirbai Karnataki, Anil Biswas): Lata Mangeshkar had sung this song in her tribute album, titled Shradhanjali. That was the first time I heard this sweet song. Since I am not too big on cover versions, I did make it a point to listen to the original. The original is from Kismet – the 1940s blockbuster that had many firsts to its credit! A sweet lullaby, there is a solo and a duet version. This is the duet. Here, the noisy clouds are being asked not to make too much noise and wake up the sleeping beloved. 2) O Badal Ghir aaye (Karwat, 1949, Asha Bhosle and Geeta Dutt, Hansraj Behl): One of the early duets of Geeta and Asha, at a time when Geeta was at the top and Asha is yet to make her mark. Asha Bhosle was said to have modelled her singing on Geeta Dutt nee Roy in her early days and in this song, the influence is evident. And this is what makes this song so fascinating. The song is a lively song about the pouring clouds, blowing breeze and their longing to be with the beloved who is in strange lands. 3) Kare badra tu na ja na ja (Shikast, 1953, Lata Mangeshkar, Shankar-Jaikishen): The beautiful Lata Mangeshkar song is from an overdramatic movie starring a brooding Dilip Kumar and Nalini Jaywant (who plays a widow of a Zamindar, and a jagirdar). This song starts off on a happy note – the cool winds, the dark clouds and the promise of the much awaited rains. But mid-way through the song, the protagonist’s sadness comes through. She is a widow and her old lover is back in the village, causing deep, suppressed sorrows to come to the fore. 4) Jab badal lehraya (Chhoo Mantar, 1956, Geeta Dutt, O.P.Nayyar): This is a lively, joyous number sung by Geeta Dutt. The protagonist is looking forward to her lover’s company on a beautiful, cool, cloudy night. 5) Jaa re badra bairi jaa (Bahana, 1960, Lata Mangeshkar, Madan Mohan): A classical number in Raag Yaman Kalyan, this Madan Mohan composition is sung delightfully by Lata Mangeshkar. The cloud is an ally, a friend who is being asked ever so sweetly to go to the beloved, who is far away and bring a message from him! 6) Rim jhim jhim badarva barse (Tangewali, 1955, Lata Mangeshkar, Salil Choudhary): This oft neglected Salil Choudhary gem is not as popular as its twin song, that mellifluous Hemant Kumar – Lata Mangeshkar duet from Jhir jhir jhir badarva barse (Parivaar, 1956) (also one of my favourites). Both the songs are more about the falling rain, and not about the clouds per se. This one is about the gentle, falling rain, the lilting breeze wafting on her face, blowing her ghoonghat away, as she waits longingly for her beloved. The video of this sweet Lata solo is not available. However, the embedded video has both the songs, one after the other. Listen to them – so very similar but not the same. Lovely. 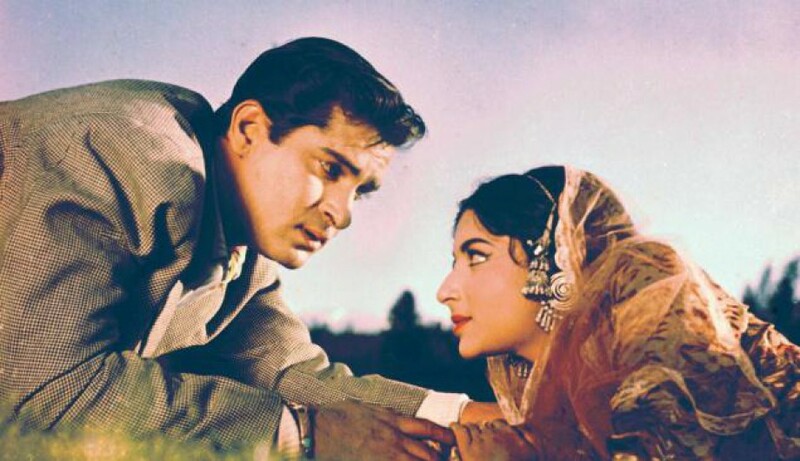 7) Yeh rang bhare badal (Tu nahin aur sahi, Mohd Rafi & Asha Bhosle, Ravi): The lovely, lingering clouds and the pleasant weather form the backdrop of this love duet. A pair of lovers embark on a journey together far away, egged on by the clouds, wind and all. 8) Chha gaye badal (Chitralekha, Mohd Rafi & Asha Bhosle, Roshan): Another love duet, again sung by Asha and Rafi, though more sensuous. It is a shimmering sunset and skies are teeming with clouds as the lovers set off together into the night. 9) Kajre badarva (Pati Patni, 1966, Lata Mangeshkar, R.D. Burman): This one is a lilting romantic number from one of R.D. Burman’s earlier movies. As the new-in-love heroine waits for evening to dawn so that she can meet her beloved, she is admonishing the thundering, pouring clouds for its wayward ways and the effect it is having on her! 10) Deewana hua badal (Kashmir ki kali, 1964, Mohd Rafi & Asha Bhosle, O.P. Nayyar): One of my all-time favourites, romantic, melodious and absolutely delightful, this song depicts the moodiness and the playfulness of the clouds and new found love! But, technically this should NOT have been here, cos the song begins with “Yeh dekhke dil jhooma…” BUT, as is, I have left out so many of my favourite cloud songs, that could not bear to leave this out! Cheating, I know… but! This entry was posted in Old Hindi songs and tagged Amirbai Karnataki, Anil Biswas, Ashok Kumar, Badal, badarva, badra, Bahana, Chha gaye badal, Chhaya, Chhoo Mantar, Chitralekha, Geeta Dutt, Hansraj Behl, Hemant Kumar, Johnny Walker, Kajre badarwa, Karwat, Kashmir Ki Kali, Kismet, Lata Mangeshkar, Madan Mohan, Mohd. Rafi, O.P.Nayyar, Parivar, Pati Patni, R.D.Burman, Ravi, Rim jhim jhim badarva, Roshan, Salil Choudhary, Shankar-Jaikishen, Tangewali, Tu Nahin aur Sahi, Yeh Rang Bhare Badal. Bookmark the permalink. As soon as I saw the title of your post, Harini, I began singing Kaare badraa tu na jaa na jaa. 🙂 It’s such a lovely song! I think almost all the songs you’ve posted were mentioned somewhere or the other in the cloud songs list I posted, though – since I’d expanded the scope of my list to ghata, megh etc, my list was actually otherwise quite different from yours! By the way, just remembered: another song that actually begins with the word badra. It’s not one of my favourite songs, but it’s well-known enough: Badraa chhaaye ke jhoole pad gaye hai ke… aaya saawan jhoomke. Nice Post. I think “Jhir jhir jhir badarva barse” is from Parivaar. You may verify. Would this fit your specifications? It’s raining here, incidentally, and I’m homesick for Bombay! 🙂 Kahaan se aaye badra was what I was humming that day and right now. It is a nice, windy, rainy day, here – quite a respite from the heat. Jari o jari o kari badariya was on my shortlist; don’t remember the logic (if any) as to why it didnt get included. I love the Shikast song- its there on the list. Gorgeous songs. The minute I read the title I thought of the wonderful Ja re badra bairi ja. How great is that song! I love all your choices. Here is one more. Thanks, Ava. Saw your comment only now!! Sorry. Pingback: Carnival of Blogs on Golden Era of Hindi Film Music – July 2015 | The world is too small? or Is it?